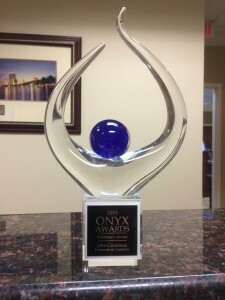 Orlando, Fla. – Crossman & Company was awarded ONYX Magazine’s Publisher’s Award for their work in promoting real estate education in all historically black colleges and universities. John Crossman accepted the award on behalf of Crossman & Company at the 11th annual ONYX Awards on Saturday, March 28. The Publisher’s Award is presented to an individual or company that had provided dedicated service, consistent advocacy and outstanding leadership to the higher education community on a regional or state level. “We’re thrilled to be recognized with this esteem honor. Real estate is important in all communities,” Crossman said. The ONYX Awards serves as a fundraiser for the Tri-County Sickle Cell Association, The Young Fathers of Central Florida and the literacy program for the Orange County Jr. Wildcats and Polk County Rattlers. The awards also paid tribute to Florida’s four historically black colleges and universities – Bethune-Cookman University, Edward Waters College, Florida Agricultural and Mechanical University and Florida Memorial University.